Grand Bahamas wedding venues perched right at water’s edge, modern, chic and award-winning are sought after by discerning couples hosting a destination wedding. Flying Fish Bahamas Restaurant fits the bill. The restaurant is a favorite of couples who want their guests to enjoy only the best cuisine. Flying Fish is the first restaurant in Grand Bahama’s history to be awarded a 4-Diamond rating by AAA – a recognition given to less than 30 restaurants in the entire Caribbean. Chef Tim was recognized in The Caribbean’s Top 25 Chefs of 2014 – Caribbean Journal Magazine. Flying Fish is rated the #1 restaurant in The Bahamas and Top 5 in the Caribbean by channelvoyager.com. Chef Tim and Manager/Sommelier, Rebecca Tibbits, are committed to a reputation of excellence and quality. Flying Fish features an array of outstanding food choices for Grand Bahamas weddings. Couples get to create their own personalized menus in concert with Chef Tim. Flying Fish’s layout spreads over exterior and interior space. Exclusive use of the entire space with Cocktail Hour being hosted on the Terrace and Floating Lounge, full service plated dinner indoors and dancing following under the stars. From all vantage points, you and your guests may enjoy the splendor of the beautiful Bell Channel Bay. Another plus is that there is no set curfew time. You and your guests may dance well into the evening. Energize guests with snacks at midnight or a time of your choice. The beauty of Flying Fish Restaurant is that it conveniently sits between two hotels – Grand Lucaya Beach and Golf Resort and bayside Pelican Bay at Lucaya Hotel so that your guests have a choice of places to stay. 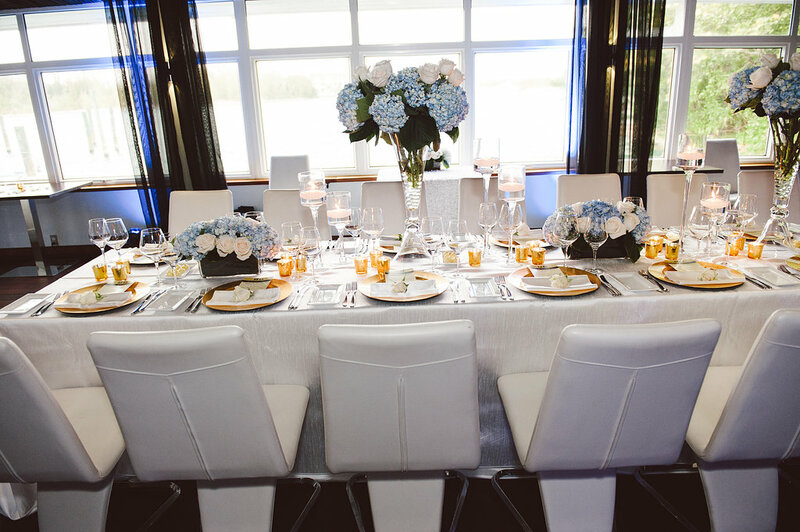 The restaurant provides an intimate private feel and hosts Grand Bahamas weddings’ sit-down events such Rehearsal Dinners, Wedding Receptions and Morning After Brunch for up to 64 guests. Up to 100 guests may be accommodated for cocktail parties. Chef Tim Tibbits is committed to delivering an innovative menu that flows with the seasons and constantly surprises the palate. Add to this, an award-winning international wine list, charming ambiance and a dedicated to excellent service, and you have everything needed to achieve the most divine event. The Grand Bahamas Wedding Venue Flying Fish Restaurant is a fabulously unique experience! Chic Bahamas Weddings would be happy to work with you to plan your beach wedding ceremony and reception dinner at Flying Fish Restaurant. Contact us today!